NPHA Holds Annual Meeting in Washington, D.C. Leaders of the U.S. national parks concessions industry recently gathered in Washington, DC, for the National Park Hospitality Association’s (NPHA) 2015 Annual Meeting entitled Concessioners and National Parks in 2016 and Beyond. The meeting – held March 23-25 – enabled NPHA members to have in-depth conversations with top National Park Service (NPS) officials, key Members of Congress and their staffs, a Government Accountability Office (GAO) study team and others on key issues. Topics included assessing the 1998 Concessions Improvement Act and its implementation; providing contemporary visitor services; and understanding Centennial opportunities and challenges. The meeting also included release and sharing of NPHA’s suggestions for changes in the NPS concessions program to better connect Americans with their parks. During the evening gathering at the end of the first day, NPHA members heard from the interim President of the National Park Foundation (NPF), Dan Wenk. Dan shared key insights from his time at NPF as the NPS Centennial is launched as well as observations on how concessioners and NPS have worked well in partnership in the past. The NPHA board met early on March 24, discussing annual meeting plans and other key matters including meetings during 2015 and 2016 and the association budget and dues. The board also approved a suggested slate of officers and directors to be presented at the annual meeting of members, including the addition of John Schoppmann as an additional Vice Chairman. For a full list of NPHA Board Members and Officers, go to parkpartners.org/NPHA-Board-and-Officers.html. The NPHA annual meeting included discussions regarding key accomplishments during the preceding year and a review of the NPHA policy paper entitled Helping Our Parks Help Our Nation: The Key Role of Concessioner-Provided Visitor Services. The policy paper is available at http://parkpartners.org/NPHA-Action-Strategy.pdf. Chairman Terry MacRae and Counselor Derrick Crandall also described key developments at NPS and with the Congress which make changes in the concessioner program in parks possible. Members unanimously approved the proposed slate of Board of Directors members and shared ideas for future NPHA meeting sites and themes. Sessions on the first day included nearly two hours of exchanges with the GAO team looking at the financial operations of the NPS, at the request of key members of the United States Senate including Senator Lisa Murkowski (R-AK), Chairman of the Committee on Energy and Natural Resources. The four GAO staffers involved in the study showed high interest in concessioner suggestions for expanding visitor services which would improve the quality and quantity of visitor experiences without additional costs to taxpayers and with real opportunities to reduce the growing backlog of deferred maintenance within national parks. NPHA members also met with a key White House Council on Environmental Quality official, Michael Degnan, to discuss the Administration’s America’s Great Outdoors initiative and the President’s newly-launched Every Kid in a Park program. Concessioners shared information about initiatives already in place to host kids in parks and outlined ways concessioners could help with the anticipated visits of 4 million fourth graders to national and state parks in the academic year beginning September 2015 – and in each year thereafter. Alex Klein described plans for a May 2015 visit by a Title I school to Grand Teton National Park and Michael expressed enthusiasm for the support of the concessioner and interest in using the event as an example of cooperation to make Every Kid in a Park a sustainable effort. NPS Director Jon Jarvis joined the meeting at noon on Day Two for remarks about NPS priorities and goals, and especially about the agency’s efforts to become more relevant to all Americans through outreach and promotion. Concessioners offered support for the NPS efforts but underscored the need to provide quality experiences to more and more diverse visitors. 1) How to make prospectuses catalysts for great offers and reduce costs to NPS and concessioners. 2) How to encourage and reward excellence in concessioner performance. 3) How to respond well to changes in visitors, technology and during the concessions contract period, including how to expedite trials and modifications of visitor services. 4) Adding concessioner-provided services in units currently without concessioners that can help increase and distribute overall visitation to the national park system. At the conclusion of the productive exchange of information and ideas, Chairman Terry MacRae and Brian agreed to increase communications and sharing of information through meetings and calls during the next year, including meetings in key parks and at key regional offices. March 25 began with a meeting of the NPHA executive committee, followed by a general session of the NPHA annual meeting featuring NPF Senior Vice President David French and NPS Centennial Coordinator Alex Viets, as well as other key officials leading the NPS Centennial Campaign Find Your Park effort. The Centennial discussion included information on the kick-off which runs the month of April 2015 and succeeding waves of “refresh” images and themes culminating in the lead up to the August 2016 actual anniversary. Information on logo licensing and use was presented and discussed. NPHA members traveled to Capitol Hill for more than an hour of conversation on Day Two with the Chairman of the House Subcommittee on Federal Lands, U.S. Representative Tom McClintock (R-CA). The wide-ranging discussion included strategies to invite more Americans to enjoy parks and other public lands and ways to build on the proven strategy of allowing private investments in needed park visitor service facilities. Chairman McClintock demonstrated great familiarity with recent adverse changes to visitor services in Yosemite National Park and the impact on park visitors and the surrounding community. Key staff of the House Committee on Natural Resources also attended, including Federal Lands Subcommittee Staff Director Erica Rhoad. NPHA members returned to the Hill on Day Three for productive meetings with House Natural Resources Committee Chairman Rob Bishop (R-UT) and House Natural Resources Committee Ranking Member Raúl Grijalva (D-AZ). NPHA leaders addressed recommendations contained in the new NPHA policy document and found strong bipartisan support. The NPHA annual meeting concluded with excellent discussions with key staff from the House Committee on Oversight and Government Reform and staff of Committee Chairman U.S. Representative Jason Chaffetz (R-UT) and Subcommittee on the Interior Chairman U.S. Representative Cynthia Lummis (R-WY). The Committee has an investigation underway of the NPS concessions program. On March 19, NPHA Counselor Derrick Crandall testified before the U.S. House of Representatives Appropriations Subcommittee on Interior, Environment and Related Agencies regarding the FY2016 budget for the National Park Service and federal recreation providers. His testimony, which offered nine specific recommendations, focused on recreation fees, the Centennial of the National Park Service and the concessions program of the National Park Service. Below is an excerpt from his testimony. The complete document is available at http://parkpartners.org/NPHA-FY2016-Budget-Testimony.pdf. In advance of next year’s National Park Service Centennial, the National Park Service and the National Park Foundation April 2 kicked off a nationwide campaign – Find Your Park -- to encourage people to learn about and connect with the 407 national park sites. Secretary of the Interior Sally Jewell joined NPS Director Jon Jarvis, NPF Interim President Dan Wenk and Centennial Ambassador Bella Thorne to unveil a musical installation and the Find Your Park Virtual View Kiosks, which will connect people in New York City and several other cities to national parks across the country over the coming weeks. This marks the beginning of the campaign to educate people about and connect them to their national parks in preparation for the Centennial celebration. The NPF is also requesting help from the parks community in spreading the Find Your Park message and has created an expanded toolkit containing displays, a media package, campaign plans, information on Centennial Premier level partners, and much more. The toolkit is available in the "Tools" section at www.nextcenturyforparks.com. To Historic Tours of America – for outstanding transportation to and from Capitol Hill! To California Parks Company – for sponsorship of the morning break. 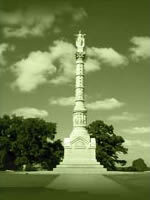 To Gettysburg Tours – for sponsorship of the afternoon break.